Vultures are in trouble. Worldwide, 73 percent of vulture species are endangered or near threatened with extinction; only six of 22 species aren't threatened. The problem is particularly bad in Africa and on the Indian subcontinent, where the birds are mostly killed by poisons and a veterinary anti-inflammatory drug used on livestock, finds a new study in the journal Biological Conservation [PDF] by Evan Buechley and Çağan Şekercioğlu of the University of Utah. The prospect of losing the unattractive, bald-headed carrion-eaters may not seem alarming for humans, but it is. Ecosystems and humans alike rely on vultures, and not only because otherwise we'd be knee-deep in carcasses. Vultures don’t just eat dead things, they do it very, very well—a group can eat a carcass in 30 minutes flat—and their finely honed efficiency puts other scavengers to shame. For example, at a slaughterhouse where Buechley studies vultures in Ethiopia, “They put out the remains of maybe 60 cows that were slaughtered in a night, and in a few hours, it is totally picked clean. And then you go to another site that is dominated by dogs, and it is just disgusting, completely disgusting,” he says. Vultures are specialists. They eat only dead things, and they are so well adapted to their diet that their stomachs kill most viruses and bacteria. When vultures go missing, more disease-ridden scavengers—feral dogs, hyenas, and jackals—tend to take their place. These animals are slower and less thorough at disposing of carcasses, which can spread diseases like rabies, Ebola, and plague the longer they sit around. In India, where vulture populations crashed by 99 percent between 1993 and 2003, the feral dog population boomed by 7 million despite government efforts to control it, causing an estimated 48,000 more human deaths from rabies. The culprit behind this massive decline in vulture populations on the Indian subcontinent was a single drug given to cattle to prevent inflammation: diclofenac, which causes kidney failure in vultures when they eat the cattle carcasses. 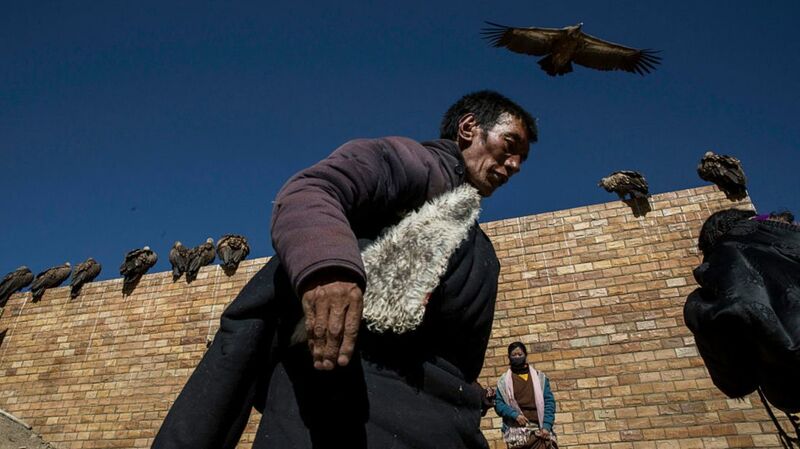 But the story of South Asia’s vultures is in many ways a regulation success story. In 2006, India, Pakistan, and Nepal banned the production of veterinary diclofenac. “The ban actually was pretty effective,” says Rick Watson, director of international programs at the Peregrine Fund. But diclofenac for humans was still for sale in 30-milliliter doses—large enough to give cattle—until 2015. Now it’s sold in human-sized 3-milliliter doses only, and the subcontinent’s vulture populations have stabilized. “The big caveat is that several species are still critically endangered,” Buechley says. “We still have to be very cautious. Vultures face different threats in Africa. First, farmers and herders poison them accidentally. Because lions eat their livestock, farmers lace carcasses with poison to try to kill the cats—but instead, they end up killing the vultures who swoop in for a meal. This is illegal but not often prosecuted. Second, ivory poachers poison vultures deliberately because their circling can alert law enforcement to poaching activity. “A big boom in ivory poaching has occurred in Africa in the last seven years,” Buechley says. One poisoned elephant carcass alone killed 600 vultures in Namibia in 2013. And third, vultures are intentionally killed for their heads and feet, believed to bestow clairvoyance in traditional medicine in southern Africa. “Poisoning has become much more prevalent over a much bigger area in the last decade or so, so populations are crashing,” Watson says. The EU does not yet ban the use of diclofenac. “Companies manufacturing these drugs that are cheap and widely used are based in the U.S. and Europe,” Buechley says. “So bringing some of that culpability home to Western civilization is important. Our society is both producing and prospering off some of this death and destruction. “But I don't think we can legislate our way out of this,” he adds. Both he and Watson think it’s critical to also work with communities to address their needs, the way the Peregrine Fund is working with the Maasai in southern Kenya to build sturdier, solar power–lit enclosures to keep their cattle safe from lions and other predators at night. Though the problems are large and complex, Watson is hopeful about the local work that’s currently going on in Africa. “It needs to be scaled up, and I think that’s feasible,” he says. The least we can do for such consummately professional scavengers is to capably work at conserving them.